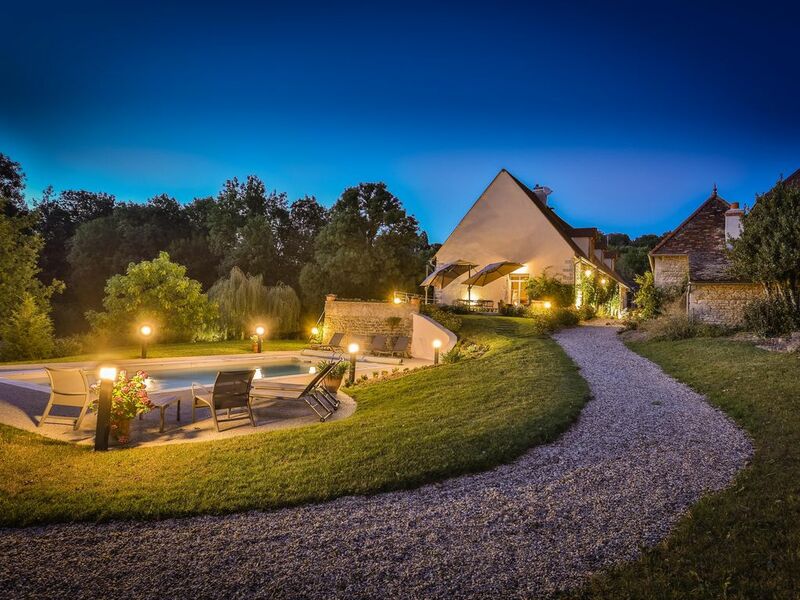 A gem of a property sleeping 12 in the heart of the Burgundy wine region. A gem of a property in the heart of the Burgundy wine region, Le Domaine sits among the vines in a peaceful vale to the south of Beaune. Dating from the late 1600s, the locals call it the ‘chateau’, but the property has always been more of a baronial farm than a residence. It was, in fact, the winery for the local lords, as the surrounding vineyards, an antique wine press and a hundred feet of vaulted cellar attest. The property has been recently transformed into a luxury farmhouse complex dedicated to the enjoyment of the culinary traditions and the natural beauty of Burgundy. With six luxurious en-suite rooms in separate buildings set around a courtyard within the acres of a walled-in park, the Domaine offers modern comfort and quiet sophistication in a setting from another era. The Dining Hall is a magnificent room laid out around an original 18th century wine press, with an open fire, flag-stone floor massive oak beams, a lounge area and bar, and a monumental staircase that floats through the space above. The Salon has parquet floors and oak-beamed 'plafond a la française'. An open fire with the original fire-back dating from 1716 is the focal point of the room, and a restored Pleyel baby grand is the center of attention. Seating for 12 comfortably. The open-plan semi-professional kitchen is in the center of household activity. Sliding metal 'atelier' doors allow the kitchen to be versatile, open or closed as needs be. Three ovens, eight burner on two tops, three refrigerators, two work islands and lots of storage make this an ideal work space for those interested in the culinary pleasures of Burgundy. An herb garden is just out the door in the courtyard. A separate bread house serves as a summer kitchen, with wood-fired oven, fridge, plancha and prep and clean-up surfaces. The walled in park below the manor house is an arboretum set in five acres, with specimen trees dating back through the history of the property. The majestic cedar that dominates the lower park and is visible from miles around, is said to date to 1802, planted to commemorate the crowning of Napoleon. A hundred feet of vaulted wine cellar is a reminder of the importance of the Domaine as a wine-making property. There are seven acres of new vineyard plantation under way above the compound that will revive the old traditions. Professional laundry facilities are available for guest use. 2 hours per day of housekeeping is included in the rental. Under floor heating as well as reversible heat pumps. Semi-professional kitchen with Lacanche cooker, 2 additional built-in ovens, a 5 fire cooking top, extraction fans, 2 large refrigerators and 2 dishwashers. 2 island counter-tops for preparation. Sonos and blue-tooth speakers available. guests can stream their own music. One downstairs bedroom is wheelchair accessible. And the entire ground floor of the Manoir is on the same level, with access to all terraces. Perfect for a family holiday. The rooms, the kitchen, the terraces, the pool, the park and gardens. All perfect...and in such a beautiful part of France. We enjoyed a very special week in this outstanding house in the beautiful Burgundy Region. We would, of course, highly recommend it for wine enthusiasts (a topic about which we learned a lot !) but it also worked very well for us as a venue for an extended family get together. The experience was enhanced further by taking up the option of a 5 course catered dinner in the house one night which was absolutely first class. David, Ingrid, John, Kirsten & families. Thanks so much for getting in touch. Burgundy is a special place; we're thrilled that you saw that. And of course, we think that the property is ideally situated to explore all that Burgundy has to offer. As for the food and wine..that's why we're here! Come see us again sometime. All the best from Burgundy. We has the most amazing time at the Chateau! The pictures do not do the beautiful property justice, on site and surrounding areas very well kept and very quintessential, especially views during afternoon pool time! Each room is very comfortable and luxuriously appointed. Great thought went into unique details of each room and space and privacy for a large group. The best part of the whole experience was the wonderful staff, who produced incredible meals for us, and made sure that our every need was met. It was a vacation that we will not soon forget. Wonderful stay and would recommend this property to anyone who wanted to immerse into the French wine country. Very high end, luxurious with every amenity, wonderful location in the vines and countryside and yet near everything. We're so pleased that you enjoyed your stay. It was obvious that you appreciated the detail work that went in to the renovation and the extensive gardens as well. Not bad weather, either! Hope to see you again soon. Thanks for your kind words! It's true, this is a remarkable place, situated in the heart of beautiful Burgundy. We enjoyed talking and tasting Burgundy wine with you. Hope to see you here again sometime. Best Property in France I've ever stayed in! Beautifully renovated, well equipped house, ideal for family/ friends gathering. Three quite separate sets of 2 double/ twin bedrooms with en-suites and seating areas, so plenty of privacy. Well equipped kitchen (loads of fridge space) and separate bar/ fridge/ dishwasher area. Plenty of seating and dining space both inside and out on two terraces. Kids loved the pool and outside space, playing volley ball in the garden. We enjoyed the views and quite surroundings. My parents enjoyed the local towns and villages; and the cakes! Daily cleaning included by lovely housekeeper/ gardener (Marie and Mark) who live next door. We didn't know they were there except when we needed them. Marie catered for us for a couple of evenings and despite us being an awkward bunch, no dairy etc... food was delicious and very reasonable. The area is beautiful if you have the energy to travel, Beaune and Dijon are worth a visit and the nearby Couches with a lovely Chateau has a delicious Patisserie/ Boulangerie. We took the train from Chagny to Beaune to visit the Hospice and enjoyed a wine tasting. There are lots of vineyards to visit and taste at, we wished we'd organised some tours before we arrived as the owners can advise on this. You will not be disappointed booking this house, we have stayed in many houses in France over the last 30 years and this is undoubtably the loveliest. We hope to return. Thanks so much for your kind words. We are so pleased that you enjoyed your stay here in Burgundy. Pleased, too, that you appreciate the peace and tranquility of this very special place. We've had lots of experience with rental villas throughout Europe, and here at the Domaine we were able to put it all together: en-suite rooms, kitchen and service facilities, seating and dining areas, terraces, pool and outside spaces. The fact that we're within acres of parkland helps a bit too! We hope you will come again. We'll be sure to introduce you to our wine-maker friends.